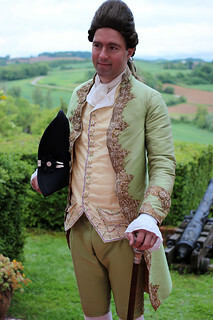 Costumes at the Château pt. 1: tambour embroidery! So I’m home, and I have so much to post about! Many costumes were worn and fabulous times were had. And I also made a tambour embroidered waistcoat for Francis, using yellow silk taffeta and various colors of silk embroidery thread. I based the design on this gorgeous piece from LACMA, which was super helpful as I could download high resolution images, and since it had never been made up, it printed off as a perfect pattern. I just had to resize it a few times and move a few things around to make it fit Francis’s pattern shape. 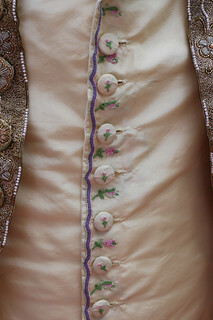 I also simplified things a bit, in that I didn’t do all the embroidery along the buttonholes — I don’t understand how/why they would cut into the embroidery to make the buttonholes. That seemed madness to me! I was sewing the actual waistcoat on the plane, in Paris, and in the château, but I got it done in time for a number of wearings! And it looked beautiful with his new green and gold suit. Wow! 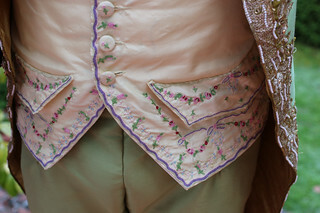 Both the waistcoat and fichu are gorgeous! Thanks you guys! They were fun projects, especially the waistcoat. Gorgeous!!! 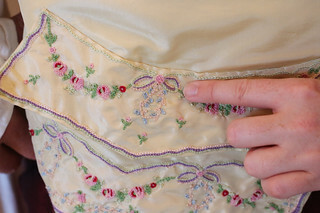 I’m amazed you got all this embroidery done on top of all the amazing new dresses. You are a machine. 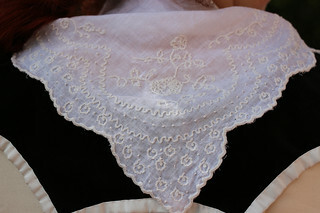 Such handsome embroidery, and it looks magical when worn. I know I’m coming very late to this post, but would you mind sharing the specifics on the threads you used for both projects? I am trying to add tambour to my skills, but every threads I have tried (started with DMC floss, then 20 wt tatting thread, pearl cotton, linen thread, then silk, and so on until I’d everything I owned) seems to get splitty and raggedy after 10-20 stitches. It’s perfectly reasonable that I am the problem, and I just need to spend a few weeks on a sampler to get the technique down, or I am using the wrong fabric for learning, but resources for troubleshooting seem pretty thin on the ground. Thanks much!